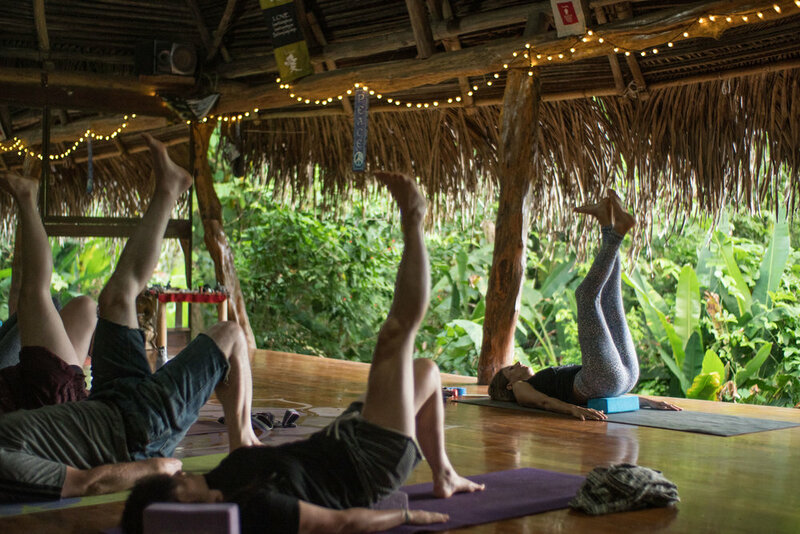 We invite you to embark on a personal journey of healing & integration in the jungle of Costa Rica. You’ll find yourself immersed in a community of supportive individuals that are healing & growing alongside you. Feel completely safe & contained as you explore the depths of your mind, body & soul with the guidance of our hosts. Do all of this in nature, surrounded by wild animals & rescue animals at the center where we will stay in the jungle. Rise to the sounds of the ocean waves and howling monkeys, start every morning with meditation & positive vibes, connect to nature by playing in the ocean, indulge in organic, local cuisine, learn what it means to build community, integrate your experience with a licensed psychotherapist, & give yourself space and time to HEAL. With so many plant medicine retreats out there, why join ours? You will work closely with our support team, which has over 25 years combined experience with plant medicine, including a world-class musician/ceremony leader, a licensed psychotherapist, and a vegan chef. Our ceremonies are SMALL & INTIMATE! Safety & security is our top priority, as with as creating a safe container within which our guests can go on their journeys. We never have more than 12 guests max per event (versus other centers in Costa Rica that have over 80 people per ceremony!). Gathering to share & integrate. Integration is of utmost importance to us! The work truly begins once you go home. The worst-case scenario is for our guests to go home feeling lost or confused about what to do next or where to go, so we incorporate strategies to ensure you return home with the tools you need to implement the changes you want to make in your life while doing so confidently & peacefully. You’ll enjoy group and one-on-one integration sessions with a licensed psychotherapist after each ceremony. PLUS you have the option of continuing your work on-line after the retreat ends with a therapist that understands your path and experience. Dave & Russ jamming out during free time. Music is integral to any ceremony experience. Our ceremony leader, David Parry, has not only assisted with ceremonies under Don Jose Campos from Pucallpa, Peru for over 12 years, he’s a well-known ceremony musician and leader who‘s music is inspired by the medicine and takes you on a unique ride that’s been described as “a magical, personal music festival of transformation”. For anyone that’s sat in ceremony with Dave, they can’t imagine sitting with anyone else & he makes the experience simply unforgettable. The music acts as a facilitator to the medicine work and is the perfect complement. His music is indigenous, new age, and everything in between. You can hear his music here! All of our events are 100% waste-free & eco-conscious. We make sure not to use single-use plastics. We use only biodegradable cleaning products. 100% of the produce used is local, organic & plant-based. We personally recycle anything that remains after the event ends. For example, we don’t buy purge buckets. We walk around and find discarded water jugs that would otherwise end up in the ocean and we cut the top off (we recycle those bits), sanitize the rest and use them for the retreat. We sanitize and re-use them until they’re not useable and then we recycle those! This is the type of care we put into not creating waste during our events. You will stay at a resort that is located on a wild animal rescue center, so your money goes towards benefitting animals in need and you get to be surrounded by the energy of beautiful wild animals! The center is located right outside of the lush Cabo Blanco Natural Reserve where wild animals are abundant. You’ll enjoy outstanding ocean views from the infinity pool outside of the deluxe rooms. If being part of a supportive, intimate community while you undergo your personal journey in a tropical paradise sounds appealing to you, then this retreat if for you. Pristine nature and jungle adventures. alongside a group of caring individuals. I'm from California but now I live in the jungle of Costa Rica. I first came to Santa Teresa in 2012 and knew immediately I was "home". It was immediately where I wanted to live, and now I've been living here for 5 years. I'll tell you the whole story when you get here! I'm a licensed marriage & family therapist (in California - LMFT# 82229) and a yoga teacher, so a perk of this retreat is that you get to work with me as you experience deep personal transformation on this soul-satisfying week-long journey. I’ve worked with this plant since 2011 and it’s an honor and privilege to do this work & create these experiences for our guests. I believe blending plant medicine with integration & personal psychotherapy is an effective way to heal for many. I first came to Mal Pais, Costa Rica in 2006 from the south coast of England. Lured here by the waves I soon fell in love with the lush jungle, beautiful beaches and array of organically grown, local, fresh foods that were available. I originally worked as a surf instructor while I ran a guest house with my uncle, but my hunger for good food and my passion for sharing it with others led me to cook for guests and to host many dinner parties. I went on to work with some of the best chefs in the area and created my private event & retreat catering company, Sourced Cooking. My personal journey has led me to being an advocate for plant-based cuisine. I’ve worked with this plant since 2013 and enjoy being of service on this medicine path. David Parry is originally from Wales and now lives in Santa Teresa, Costa Rica. Dave is a professional plant medicine ceremony musician and leader. Dave assisted with ceremonies under Don Jose Campos from Pucallpa, Peru for over 12 years. His unique & magical music acts as a facilitator to the medicine work. Since his first ceremony, he has known that the highest path is to live in service to others. He honors this through his peaceful, caring presence & ensures that everyone has a safe, smooth experience. You can hear his music here! Unhealthy eating habits can affect the quality of our emotional and physical life. Discover how delicious and fulfilling eating healthy can be, and you'll be surprised at how good you feel. We won't be "cleansing" by any means, just enjoying clean, gourmet organic, locally-sourced food from a personal chef (Russell!) all made with love and gratitude. You'll find that eating healthy is not only good for you, but it's also a fun thing to explore! One guest even lost 10 pounds after our retreat, accidentally! Savor daily fulfilling plant-based meals cooked from locally grown, organic produce by Chef Russell. We’ll also provide fresh juices each day. All included. This isn't a "yoga retreat", so we won't be doing anything too crazy! But each morning, we'll wake up and meet outside to enjoy the fresh morning air. We'll gently stretch our bodies to work out any kinks and then we'll practice various simple meditation techniques. You'll experience the benefits of being able to calm your mind and rest your heart, a skill you'll take into ceremony with you and that you’ll surely find useful back home. One evening, we will go off-site to experience a crystal bowl healing bath with other special instruments intended to provide deep healing vibrations to your being. This all is part of the process of rejuvenation, exploration and fulfillment. Enjoy working with a licensed psychotherapist! Integration is what brings the work together. We’ve found that our guests enjoy and benefit from our integration sessions as much as or even more than ceremonies themselves! We will gather as a group the day after each ceremony to process our experiences and to be of support to one another. You also have the option of meeting with Rima one-on-one throughout the week and continuing your work on-line with a therapist that understands your unique experience once you go back to your normal life. We include group and one-on-one integration sessions with a licensed psychotherapist, as well as pre-screening/technique/tips and post-integrations services. Enjoying our free time by jamming together. Music and singing are so closely linked to healing & community and we love to encourage our guests to play instruments and sing. We provide epic musical accompaniment throughout the whole event and offer opportunities and space to jam together as a group during free time. Our retreat guests often sing in ceremony even when they’ve never sat in ceremony before (they feel that supported and comfortable!). We’ll learn songs together. Come find your voice and be inspired with us. Our ceremony leader is a well-known ceremony musician who‘s music is inspired by the medicine and takes you on a unique ride that’s been described as “a magical, personal music festival of transformation”. The music acts as a facilitator to the medicine work and is the perfect complement. We'll sit in three ceremonies as a group filled with music and singing and we’ll have instruments to play throughout the week. Where we stay is also a fully functioning and ethical wild animal rescue center. Animals are routinely released back into the wild as soon as they are able to be and only kept at the center if their release would endanger their life. You’ll learn about all of this and more on our tour of the rescue center. We got lucky last time and got to experience a release of a howler monkey into the wild! Taking selfies or touching the animals is not beneficial for their well-being so please don’t expect to interact with animals in this way! We will only view them from a safe distance and in ways that are approved and legal. Enjoy an ethical and informational tour of a wild animal rescue center. As a group, we’ll take a trip to a local waterfall that is on private property and rarely gets visitors! We’ll enjoy lunch by the natural fresh water pools, rope jump and dive into the cool water, and heal from the waterfall’s power. Adventure to a local waterfall that tourists rarely get to see! Imagine taking a small plane that lands on a landing strip that meets the ocean. Your taxi awaits you & takes you down the peninsula to the rustic road that runs through Cabuya, a sleepy coastal farm town on the Nicoyan peninsula. Your driver turns up a road and you begin to ascend into the jungle, higher and higher. Soon you arrive to Wild Sun Jungle Resort, nestled in the foothills of the Cabo Blanco National Park in Costa Rica. You enter, and the first thing you notice is that you're surrounded by lush green jungle, breathtaking ocean views, wild animals & gorgeous accommodations. The photos don’t do it justice, as many of our previous guests said!! You're taken to your bedroom and you set your stuff down to relax. Ahhh... you've finally arrived. Plop down on the luscious bed, kick off your shoes, take a shower and relax with a tropical fruit smoothie before meeting the group. Throughout the week, you'll awaken with the howler monkeys as you enjoy the comfort of luxury within the peace and quiet of the wild and enchanting Costa Rican jungle. Savor the jungle views during breakfast or from the stunning pool. Look out to the horizon and let your worries melt away as the waves of the ocean roll into the shore. Spend the afternoon bathing in the sun and dipping in and out of the beautiful pool. It's time for dinner, enjoy gourmet food prepared by our private chef poolside and dine to the sounds of nature and the crashing waves in the distance. Wild Sun is also a rescue center, so we’ll tour the center and all profits to the center go towards the animals and projects! This retreat is All- Inclusive. Just get yourself to and from the retreat center, and we take care of the rest. Save your space for May 4 - 11 Healing with Plant Consciousness with a $400 deposit.